What exactly is a dissecting microscope? There are several different types of dissecting microscopes and we will cover each of them below. A dissection microscope is also referred to as a stereo microscope or a low power microscope. Dissecting microscopes have working room on the stage. There is room to place larger objects such as rocks or nuts and bolts. In order words, the microscopy sample does not need to be on a microscope slide. Dissecting microscopes use light from above the stage, making it possible to view opaque objects. Some dissecting microscopes also have light beneath the stage, but not always. Dissecting microscopes provide low magnification (usually 10x - 40x is a common range) and they are used to view detail in objects you can already see with the naked eye. Blood cells are not viewed with a dissecting microscope, but rather with a compound microscope. Single power dissecting microscopes offer one single magnification. For example, the microscope might provide 20x magnification. These single power instruments are common in museums or schools where only one magnification is required to view samples. With a single power magnification dissection microscope it is possible to have two magnifications when using a different pair of eyepieces. For example, with a 10x and 15x pair of eyepieces (when the built-in objective is 2x) total magnification would be 20x and 30x. This is an inexpensive way to achieve multiple magnifications from a lower cost microscope. 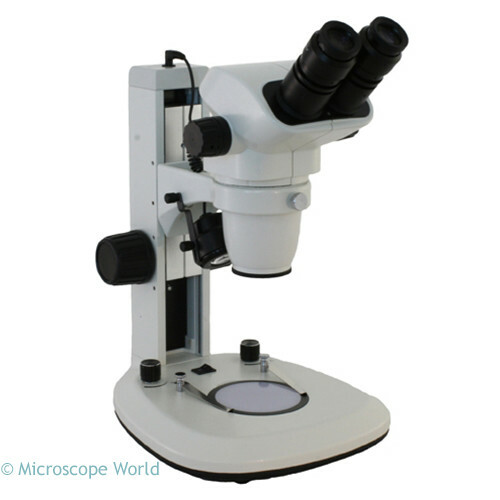 Dual power dissecting microscopes provide two set magnifications. By turning a turret on the bottom of the body of the microscope (the black portion on the image at right), it is possible to flip back and forth between the two magnifications. The objective lenses are built into the microscope (for example, 1x and 3x) and the eyepieces can be changed. On a microscope that includes 10x eyepieces with a built-in 1x and 3x objective, the total magnification is 10x and 30x. Magnification could be increased by purchasing a pair of 15x eyepieces, which would provide 15x and 45x magnification. 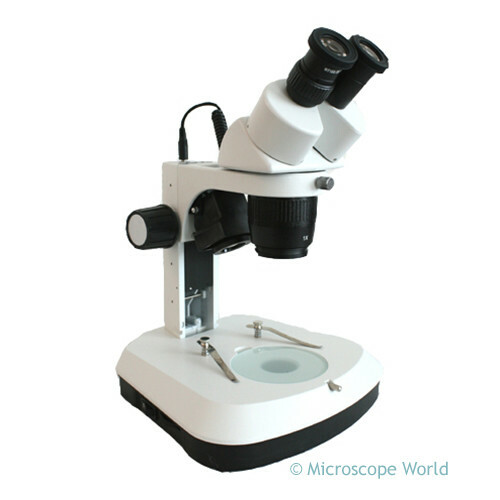 These microscopes are sometimes used by coin collectors, in schools, and in industrial quality control settings where an inexpensive microscope is required. 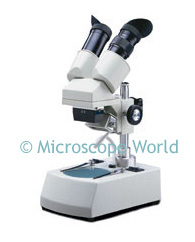 Stereo zoom microscopes provide a magnification range and all magnifications within this range can be viewed. The S6 stereo microscope shown at left provides magnification of 6.7x - 45x, which means you can see 10x, 15x, 18x, etc. all the way up to 45x. These are the most commonly used dissecting microscopes, since they provide more options for viewing the exact part of the sample at the desired magnification. 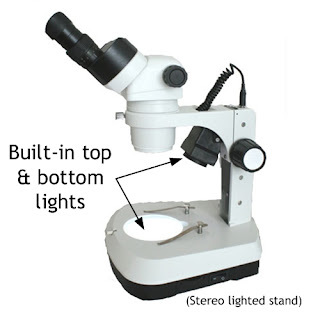 Typically when increasing magnification on a stereo zoom dissection microscope, rather than changing eyepieces, an auxiliary lens is added to the bottom of the stereo microscope body. If you were using the microscope shown at left and wanted a bit more magnification, you might add the 1.5x auxiliary lens, which would change the magnification range to 10x - 67.5x. Stereo zoom microscopes are typically used in universities, in industrial settings for quality control and to view small parts, and in manufacturing.